Share "How to Avoid 10 Common Lawn and Garden Problems"
One of the most aggravating lawn weeds, dandelions are found in nearly every type of lawn and with their fast growth and wide-spreading seeds, they can be difficult to remove. The Solution – Aerate and dethatch your lawn to build strong turf that won't have room for dandelions, add calcium to the soil to make it less dandelion-friendly and use a selective herbicide formulated to remove these unwanted weeds. The thick, tough blades of crabgrass and its spreading growth pattern can quickly overtake a lawn, patio, sidewalk or paving stones. The Solution – Mow your grass slightly higher to keep crabgrass from getting established, and look for a herbicide specially formulated to fight crabgrass. Healthy turf will keep this weed from spreading quickly. Grubs are the larvae form of many different insects, but the results are the same for your lawn no matter which grub is present: wilting plants, dead patches and moles, raccoons and other wildlife that feast on grubs. The Solution – Aerate your lawn to remove thatch that grubs eat, and opt for specialized insecticides that target grub species. It may be necessary for a professional consultation to determine exactly which grubs are damaging your lawn and garden. A thin, patchy lawn is an open invitation for weeds to take over, and it is unsightly for homeowners who take pride in their turf. The Solution – Reseed the bare or thin areas, keeping the seed damp and staying off the area until new seedlings are well established. If the area is large enough, it may be more effective to break up the soil and lay new sod instead. If your lawn is turning yellow rather than a lush green, it may be suffering from iron deficiency, but if the yellow is just in patches, dog urine may be to blame. The Solution – Add sulfur to an iron-deficient lawn and avoid overwatering, which can leach iron out of the soil and cause yellowing. If a dog is the problem, train the pet to only use one area, and water the lawn more to help rinse urine away and restore its color. Slimy slugs are the bane of many gardeners, and they chew through many different types of leaves, damaging fruits, vegetables, flowers and shrubs alike. The Solution – Use copper barriers around plants to keep slugs away, or consider slug traps or bait to catch the pests. Attracting birds to the yard or frogs to a backyard pond can provide natural pest control as they feed on slugs. Deer may be picturesque, but they're less photogenic when they're chewing up a garden or flowerbed and leaving their droppings sprinkled over the lawn. The Solution – Opt for deer-resistant plantings and surround a garden with a double fence with 2-5 feet between each layer, since deer are reluctant to jump long distances over a fence. Shorter double fences can be more effective than a single taller fence. Weeds can quickly take over a garden, suffocating desirable seedlings, usurping precious water and making it harder to tend vegetables. The Solution – Pull weeds regularly before they begin to spread, and consider mulching deeply around garden rows to minimize weed growth. 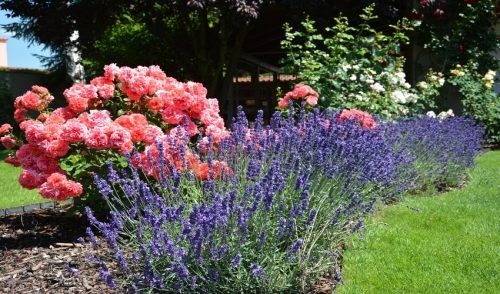 If necessary, use a selective weed herbicide, but take care not to contaminate garden plants when spraying. Mushrooms and toadstools can spring up overnight, creating unsightly patches of fungus in even the greenest, best kept lawn. The Solution – Correct the lawn's drainage to avoid boggy, wet patches where mushrooms thrive, and dethatch the lawn so there is less decaying material for mushrooms to feed on. Pull mushrooms as soon as they appear so they don't spread as quickly. Hotter, longer summers can lead to droughts that devastate a garden, and community water restrictions can make it difficult to keep a lawn or garden properly hydrated. The Solution – Opt for drought-resistant turf, xeriscaping and plants that thrive on less water. Use drip hoses in the garden so no water is wasted, and mulch deeply to keep soil moist. Use compost regularly, and consider adding shade trees to the yard to shelter turf.